The purpose of the based on adsorbent block unit CMM-3,5Z is to remove solid contaminants and free water from lubricating and insulation oils with viscosity below 70 cSt at 500С by means of zeolite (molecular sieves) or silica gel (oil acid number reducing) and its further reactivation in this unit. The adsorbent reactivation system helps to use the same adsorbent a lot of times before it must be changed. The unit is equipped with the carbon filter intended to reduce the hazard emissions into atmosphere during adsorbent reactivation process. The unit may be used for installation, repairs and operation of oil filled high voltage equipment with the voltage no more than 1150 kV (power transformers, high voltage switch gears etc). Most frequently encountered contaminants in oil are water, gases and solids. These contaminants are detrimental to the performance and life of the oil. Oil purification and regeneration equipment produced by GlobeCore is intended for purification of oils by means of thermo-vacuum process and regeneration by means of special adsorbents. 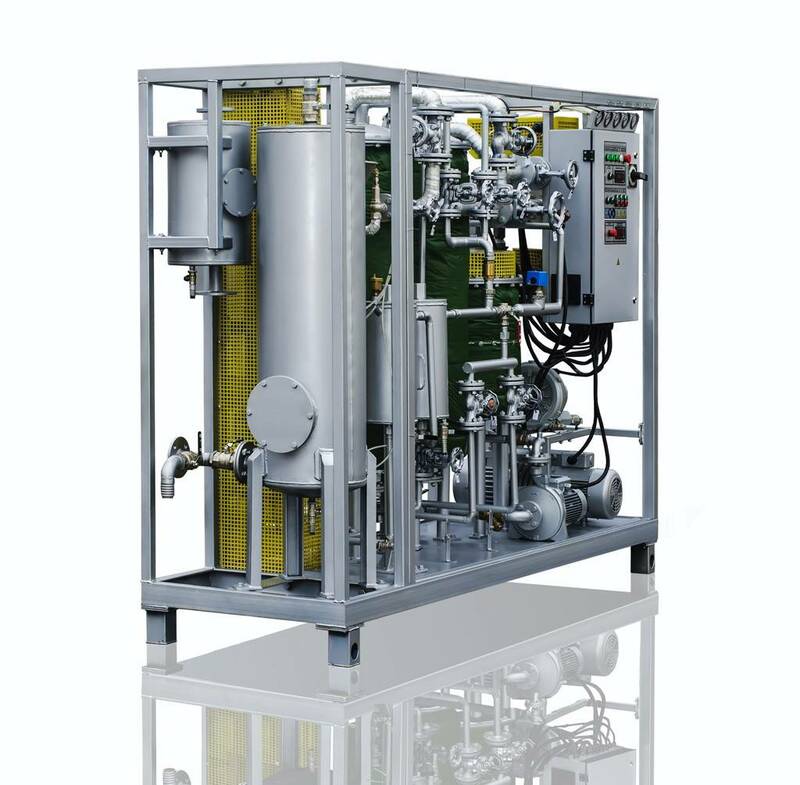 Oil purification and regeneration units are fully acceptable for the following mineral oils: • Insulating (Transformer Oils) • Lubricating Oils • Turbine Oils • Compressor Seal Oils • Quenching Oils • Cutting and Cooling Mineral Oils Operational conditions: • Oil viscosity must not exceed 70 cSt at 50°C. • Ambient temperature in the range from +5 to +45°C; • Atmospheric pressure from 84 to 106.7 kPa (630 to 830 mm hg. ); • Altitude above sea level up to 2000 m; • Fire-proof and ex-proof operation area. If the unit is operated indoors, the output of the exhaust gases in atmosphere through the pipe lines should be supplied.The scope of supply of this specification shall include the design, fabrication and factory testing of Oil Regeneration Plant model CMM-3.5Z. Equipment will be mounted on castor wheels or metal supports and supplied in the form of a pre-piped and pre-wired package and shall provide a fully workable unit in accordance with this specification when received by the purchaser. Main unit parameters are shown in table. temperature – no less 5 ºС. The Unit (Fig. 1, 2) is frame based metal platform with tray, where located all components and sub-units. Mobile oil station on the basis of adsorbent block (see Figure 2) consists of: inlet pump, mesh filter, oil heater, coarse and fine cartridge filters, adsorbent columns, steam generator, air heater, vacuum pump, air blower, oil trap, piping system with shut-off and control valves, complete control unit, carbon filter, exhaust trap. Main parameters are being controlled by: temperature controller device 2TRM “OWEN” with sensors ТСМ, pressure gauges and vacuum gauge. Figure 2 – General view of the unit. Electric pump – 1, coarse and fine cartridge filter – 2, oil heater – 3, mesh filter – 4, adsorbent columns AC (I-II) – 5, steam generator – 6, air heater – 7, vacuum pump – 8, air blower – 9, oil trap – 10, piping system with shut-off and control valves – 11, complete control unit – 12, carbon filter – 13, exhaust trap – 14. Processing oil is fed by electric centrifugal pump through the inlet valve, brass mesh filter and comes through oil heater, three-way valve and oil filters into processed oil tank. Coarse and Fine filters are designed to filter the treated oil. Filter fineness is accordingly 25 and 5 microns (2 microns filter cartridges as option). Filtration can be performed both with oil heating, and without heating. Parallel mode. Processing oil goes through the input valve, mesh filter, electric pump, oil heater and valves to the adsorbent columns AC (I-II), where oil treatment process occurs. Then oil goes through filters into processed oil tank. Series mode. Processing oil goes through the input valve, mesh filter, electric pump, oil heater, three-way valve V2, valve V4, first adsorbent column ACI, valve V17, second adsorbent column ACII, where oil drying process occurs. Then the oil goes through valve V5, filters OF, valve V18 to the processed oil tank. If using zeolite in one adsorbent column and silica gel in another one during series mode it is possible to make the oil regeneration, providing oil dehydration and decolorization; acid number, optical density and ash content decreasing, removing of oil detritus and ageing residues. Note. Zeolite oil dehydration temperature should not exceed 600 С, as exceeding of oil temperature can result the inverse effect – return of moisture from zeolite to oil. Zeolite reactivation process includes three stages: 1. Hot steam washing. 2. Hot air blowdown. 3. Vacuumizing and cooling. Water steam is formed from filled in the steam generator water (12-14 litres) by means of electrodes, reaches 5.5-6 bar and enters the adsorbent column AC (I-II) through the safety valve and pipelines; passing through columns it washes zeolite. This process takes about 30-40 minutes, including water filling and steam heating. Washing procedure to be done 3-4 times. Hot air blowdown. Air blower takes air in the air heater where it is heated to the required temperature. Hot air is directed to the adsorbent columns AC (I-II), where zeolite is being processed. Adsorbent columns AC (I-II), connected to vacuum pump VP with pipe lines, are being vacuumized. After vacuumizing zeolite becomes cool, completely dry and ready for operation again. To avoid any environment pollution and in order to reduce the hazard emissions into atmosphere during zeolite reactivation the unit is equipped with the carbon filter.